Safety signs are required to help reduce risk of injury or adivse of a potential hazard or danger. Safety signs are not only required because of legal requirements, but they should also be placed to help create a safer working environment. 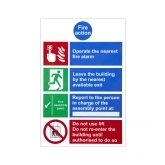 We manufacture all types of safety signs and have stock items of the most popular ones such as Fire Exit, Fire Action and Fire Door Signs.